One key variable when designing resistance-training programs is the prescription of intensity. In fact, training intensity is generally acknowledged as the most important factor in terms of improving strength levels (1,2). However, one common problem that strength and conditioning coaches face is how to objectively and accurately quantify intensity in order to design and prescribe resistance-training programs. The most widespread method for determining resistance-training intensities is the calculation of the 1-repetition-maximum (1-RM), that’s it, the load that can be lifted just once (3); however, its measurement has some important limitations that should be noted. Probably, the main issue when prescribing training intensities based on the 1-RM, is that the 1-RM can greatly vary over time: it can either be higher or lower than expected due to several factors such as rest, fatigue, training volume, nutritional status, etc. Moreover, it has been extensively shown that resistance training can significantly improve the 1-RM in periods of time as short as 3 weeks (4). Thus, we can only be 100% sure that our athlete or client is training with the desired exact intensity (i.e., %1-RM) on the measurement day. Next training sessions we can’t know what intensity corresponds to the prescribed loads if 1-RM is not measured. For this, in order to accurately prescribe training intensities on a daily basis, the 1-RM should be measured before each training session; however, the measurement of the 1-RM requires a maximal effort that could increase the risk of overtraining and injuries, especially if it would be performed every day. Therefore, 1-RM shouldn’t be measured that frequently. Addressing this problems, a new approach to accurately estimate the 1-RM without actually conducting a 1-RM has emerged based on in-vitro observations made by physiologist A.V. Hill who demonstrated that an almost perfect relationship exists between the shortening speed of muscle fibers and the force they produce (5). These microscopic experiments (which helped him getting the Nobel prize back in the 30’s) has been extensively reproduced and, during the last years, macroscopic research has shown that the load used in resistance-exercises (in terms of %1-RM) is highly related to the velocity at which the lift is performed (6–8). Thus, the higher the load one uses, the lower the velocity at which the lift will be performed. Moreover, the correlation between load and movement velocity is so high that it has been demonstrated that, first, each %1-RM and the 1-RM itself can be estimated with high accuracy just by measuring the movement velocity of some submaximal loads and, second, that everybody has similar velocities for each %1-RM. For example, everybody bench-presses the 80%1-RM at 0.46m/s approximately. Therefore, we don’t need to conduct direct 1-RM measurements every day; you just need to measure the speed at which you are moving the barbell and you will know if the load used is appropriate or not for you that day. Several technologies have been used in sport sciences labs to measure barbell velocity, such as force platforms, tridimensional video-cameras, linear transducers and accelerometers. Linear transducers, which basically consists on a cable that is attached to the barbell from the ground, are probably the most used instrumental to track barbell velocity in the weight room, since it’s more practical and less expensive than force platforms and professional camera systems, although they are still not for everybody: its prize ranges from several hundreds to almost 3k bucks. For this, development of new technologies that allows the measurement of barbell velocity in a practical, accurate, valid and yet affordable way is a must. And that’s exactly what was done with the PowerLift app. PowerLift is a new iPhone app that measures barbell velocity and estimates the 1-RM using the load-velocity relationship described above. Its setup is very simple: first, you need to enter your range of motion on the app (for example, in the bench press it’s the vertical distance from the chest to the barbell at the end of the lift) which can be easily measured with a metric tape. Then, you need to record a video of your lift and then select the start and end of the movement thanks to the frame-by-frame navigation of the app. Finally, the app calculates barbell velocity using the well-known Newtonian equation: v = s/t. Although this process could seem too basic, it’s actually really accurate: thanks to the high-speed video recording on the iPhone 5s and newer, the difference between one frame and the previous or next frame is as small as 4 milliseconds, making the velocity measurement very accurate. In fact, the accuracy, validity and reliability of the app has been recently tested in a scientific study of ours which is currently under review in a peer-reviewed scientific journal. Results were amazing: we measured the velocity of 130 individual repetitions on the bench-press exercise using a $2k professional linear transducer and the PowerLift app simultaneously, and an almost perfect correlation between both devices was observed (r = 0.94, standard error between instruments = 0.028m/s). 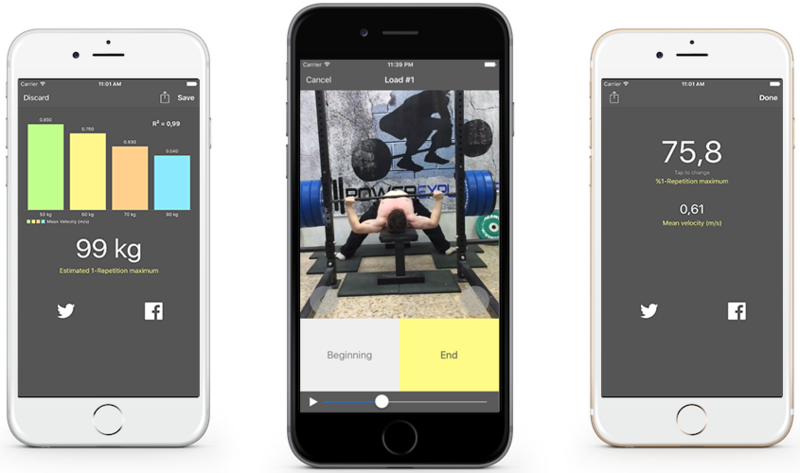 Moreover, we made 10 elite powerlifters conduct an incremental test on the bench-press exercise until they reach their actual 1-RM (in most cases, athletes performed 5 sets with 80, 85, 90, 95 and 100%1-RM), and we recorded all the lifts with the app. 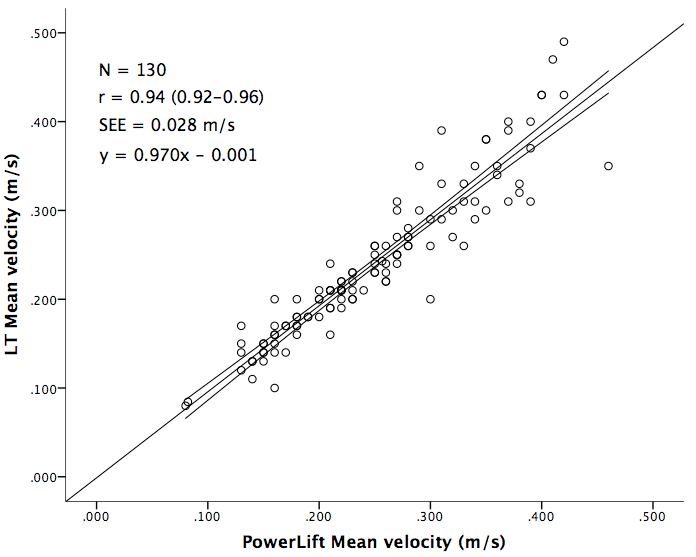 Then, PowerLift estimated the 1-RM on the basis of barbell velocity of the submaximal loads, and there were no statistically significant differences between the estimated 1-RM and the actual 1-RM. There are two type of tests on PowerLift that helps athletes and coaches estimate their 1-RM: the full-test and the quick-test. When you first open the app and create your user, you are asked to conduct a full-test, which consist on 4 sets of 1 repetition with increasing submaximal loads. For example, if you think your 1-RM is about 500lb, use loads about 75, 80, 85 and 90% of that. PowerLift will calculate your individual load-velocity relationship as well as your predicted 1-RM, and then it will save it in your profile. Then, on your next training session, you just need to use a quick-test which only requires the measurement of 1 submaximal load. That way, just by measuring the velocity of the barbell with one load you will know in less than a minute your 1-RM of that day so you can adjust your program to match the desired intensity. Picture this: you go to the gym ready for a 5×5@80%1-RM bench-press session. You think you should use 220lb according to your last 1-RM performed 3 weeks ago, but instead of trusting this is your 80%, you want to actually probe it. So you pick up your iPhone and after a proper warm up you record yourself making one repetition with those 220lb, and the app tells you that your 1-RM today is 300lb. Thus, that 220lb actually represents 73%1-RM. That way, you decide to add 20 extra pounds to your barbell so you really train at the programmed intensity. This novel approach could really help athletes to estimate their 1-RM and adjust their training intensities accurately in a daily basis. Following, I will show you a real case example on how PowerLift is being used by an elite powerlifter to break some incredible records. Besides being a famous fitness youtuber and instagramer in Spain and Latin America (see his YouTube channel or Instagram account for some amazing videos of his lifts), David Marchante is a Spanish elite powerlifter who has been using the load-velocity relationship for years in his trainings. While preparing for the bench-press European Championship, he was using a linear transducer every day in order to accurately adjust its daily training load, but one problem came to his head: he was able to know his 1-RM every training day, but what about on the really important day, that’s it, the day of the competition? Powerlifting rules doesn’t allow using a linear transducer or devices like that in competition, so there was no way he could accurately estimate his 1-RM on that day, and that was crucial for him since he aimed to win the European Championship and break the European junior record and didn’t know if he would be able to do it. Fortunately, he came up with an idea: he asked a friend to record his lifts during competition with his iPhone, which is perfectly valid with competition rules. Since there are 3 attempts in powerlifting competition, he asked his friend to record attempt 1 and 2 (which he performed with 397 and 408lb, respectively) and observed that he was lifting the bar a bit faster than usual so, consequently, he decided to go for 419lb on attempt 3 which meant winning the Championship and breaking the record. Currently, David is using PowerLift for another great purpose: breaking the weighted pull-up World Record. Using the same approach than for his bench-press competition, David has been using PowerLift for the last months to adjust his training intensity in the weighted pull-up exercise and his preparation has been great so far. You can check David’s Instagram to watch him make a 1-RM pull-up with 115kg (253.5lb) which is an unofficial World Record, but next October 13th, 2016, he will try to do it live on the most famous Spanish TV show (El Hormiguero) with official Guinness World Record judges. Wish him luck! 1. Folland JP, Williams AG. The Adaptations to Strength Training. Sport Med. 2007;37(2):145–68. 2. Fry AC. The Role of Resistance Exercise Intensity on Muscle Fibre Adaptations. Sport Med. 2004;34(10):663–79. 4. Marshall PW, McEwen M, Robbins DW. Strength and neuromuscular adaptation following one, four, and eight sets of high intensity resistance exercise in trained males. Eur J Appl Physiol. 2011/04/01. 2011;111(12):3007–16. 5. Hill A V. The heat of shortening and the dynamic constants of muscle. Proc R Soc L B Biol Sci. 1938;126:136–95. 6. Gonzalez-Badillo JJ, Sánchez-Medina L. Movement Velocity as a Measure of Loading Intensity in Resistance Training. Int J Sports Med. 2010;31(5):347–52. 7. Jidovtseff B, Harris NK, Crielaard J-M, Cronin JB. Using the load-velocity relationship for 1rm prediction. J Strength Cond Res. 2011;25(1):267–70. 8. Conceição F, Fernandes J, Lewis M, Gonzaléz-Badillo JJ, Jimenéz-Reyes P. Movement velocity as a measure of exercise intensity in three lower limb exercises. J Sports Sci. 2016 Jun 17;34(12):1099–106. Carlos is a sport scientist from the European University of Madrid, Spain. His main interests are strength training and testing with elite athletes, as well as sport technologies to optimize performance. He has a PhD. and two MSc. on High Performance in Sports and has authored several scientific papers on peer-review journals. Additionally, he is the main author of “Strength Training: New Methodological Perspectives”, the first multi-touch sport-sciences iBook in Spanish with more than 15.000 downloads all over the world.